Founded in 1999, Either Or at Sohrab Hall is a miscellany of everything awsome and hand-crafted – from contemporary clothing to home decor, furnishings, toys, accessories and even socially-sensitive literature. At Either Or, there is a story behind every product that is on showcase, especially when it comes to fashion. 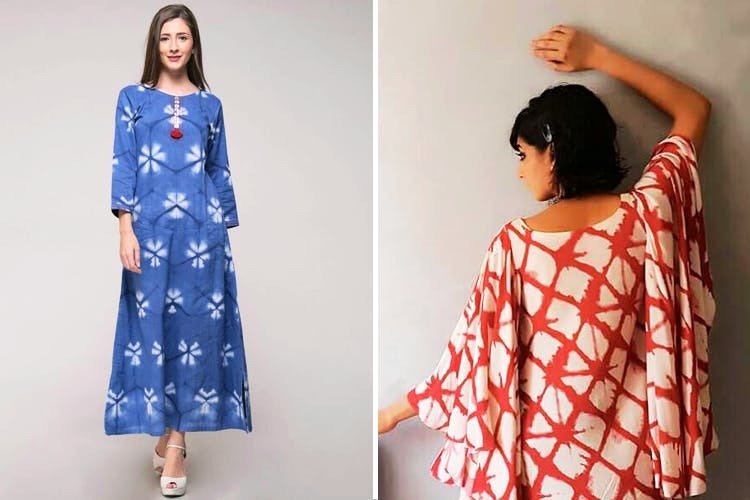 If you love minimalist, functional, handmade cotton attires, Either Or is the place to be! The seashell and the Dutch white chikan anarkalis, starting INR 2,500 are elegantly designed. Wear it with a pair of beautiful zaffre floral chandbalis (INR 800) and you’re good to go! Asymmetrical dresses in bold quirky prints are the season’s hits at Either Or! We totally adored the floral shirt dresses in soft cotton and the flowy midi swing dresses in unconventional Boho prints, starting INR 1,500. Check out the prettiest pairs of slip-ons, jutis and strappy sandals out here. They are chic, colourful, handcrafted and celebrate Indian trends with a twist! We were infatuated with the collection of tote bags, purses and wallets. The ‘Meena Kumari’, Sholay-inspired canvas bags for INR 550 are the total head-turners. Also, the classy solid-colour bagpacks and totes are pure gold out here! The home decor collection at Either Or is a burst of vibrant eco-friendly products, starting from hanging lanterns to posters, monolithic coasters, bead-embedded mirrors, cushions, vases and more! Amp up your dressing table with beautifully handcrafted wooden bangle-holders or revamp your walls with old Hindi film posters (INR 600) and oddly-shaped photo frames, starting INR 350. Also check out the warli-art inspired pots and vases! Don’t ignore your workstation! Amp it up with uber-cool diaries, pencil holder, multi-coloured jars and mugs, exclusively from Either Or. Either Or is a combination of traditional and new-age fashion inspired from different and lesser-known communities of India. The products are undoubtedly unique and hence, a tad bit expensive! But trust us, once you check out the collection, you won’t regret one bit. Because we didn’t!